The owners of the New York Mets are facing off in court with the trustee in the Bernard Madoff Ponzi case. NEW YORK (CNNMoney) -- Did the owners of the New York Mets know that they were part of a Ponzi scheme when they invested with Bernie Madoff? That's the question a jury will be tasked with answering during a trial that begins this week. If the answer is yes, then the team's owners will have to surrender as much as $303.4 million in ill-gotten gains to Irving Picard, the court-appointed trustee in the Madoff case. This figure represents how much the Mets profited from Madoff's Ponzi scheme, which cheated thousands of investors out of more than $17 billion. It's a high-stakes case for both parties. The Mets are already facing financial peril, and a ruling that requires the team to pay out millions of dollars will only make things worse. If Picard loses the case, that could make it more difficult for him to recover the investor funds he is seeking via other lawsuits. So far, the trustee has collected about $9 billion of the money lost to Madoff's scheme, all of which will be returned to the victims. In the suit against the Mets, lawyers for Picard specifically allege that team owners Fred Wilpon, Saul Katz and their partners engaged in "willful blindness." That's another way of saying that the Mets knew that Madoff's investment firm was a front for a pyramid-style scam, but chose to invest with him anyway. Richard Scheff, chairman of the law firm Montgomery, McCracken, Walker & Rhoads, said that willful blindness is hard to prove, but it can be done. Scheff is not connected to this case, and added that the trustee would have to prove that they suspected that Madoff was fishy, perhaps using recorded comments from the Mets owners. The trustee, who's with the law firm Baker & Hostetler, has had mixed results going after funds from the Mets so far. Picard originally sued the owners for $1 billion. That figure included $700 million in principal. But last year, Judge Jed Rakoff of U.S. District Court in the Southern District of New York dismissed the trustee's suit for $700 million in principal. Rakoff took up the issue again in January, when he upheld his earlier decision to dismiss the $700 million portion of the suit. Then Picard got some good news, when Rakoff ruled on March 5 that the Mets owners could owe the trustee up to $83.3 million. This figure represents the profits made by the Mets owners in the two years leading up to the collapse of the Ponzi scheme on Dec. 11, 2008, when Madoff was arrested. Rakoff will decide on the exact amount at a later time. 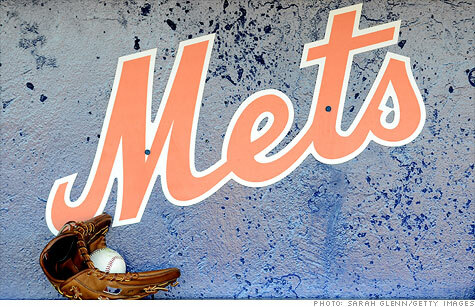 The owners of the Mets have denied that they knew Madoff was operating a scam. The Mets owners and the trustee's office would not comment for this story. Meanwhile, Madoff is far away from the action, languishing at a medium-security federal prison in Butner, N.C. He pleaded guilty in March of 2009 to running the largest, most sweeping Ponzi scheme in history. Madoff, age 73, was sentenced to 150 years. Madoff, a Mets fan who had his own customized satin Mets jacket, completely wiped out many of his victims with his scam. Picard has sued hundreds of those investors who profited from the scheme, meaning that they withdrew more money from Madoff's firm than they invested. He's had mixed success with the suits. The trustee's biggest triumph was settling for $7.2 billion with the widow of Jeffry Picower, who is believed to be Madoff's biggest benefactor. But his $19 billion lawsuit against JPMorgan Chase (JPM, Fortune 500) and his $2 billion suit against UBS (UBS) were dismissed by the judge. Picard's biggest defeat to date was in February, when the judge tossed out his $20 billion lawsuit against Austrian banker Sonja Kohn and her co-defendants, who were accused of recruiting European investors and funneling their money into Madoff's firm.